New Delhi: The Indian Institute of Mass Communication, or IIMC, is an obvious choice for graduates wanting to pursue a career in journalism. This year, IIMC got 6,500 applications for the 282 seats on offer in its four flagship programmes, meaning that only four out of 100 applicants stand a chance of admission to the class of 2009-10. IIMC offers postgraduate diplomas in English journalism, Hindi journalism, radio and television journalism, and advertising and public relations. The IIMC story began in 1962-63, when the government approached the United Nations Educational, Scientific and Cultural Organization (Unesco) and the Ford Foundation, seeking their help in establishing a platform to make effective use of communication for the country’s development. The blueprint, prepared by a team of communication experts headed by Wilbur Schramm, the US scholar sometimes referred to as the “father of communication studies", led to the birth of IIMC in 1965. Then information and broadcasting minister Indira Gandhi inaugurated the institute. Run from a small premises in New Delhi’s South Extension area, it offered just one journalism course. “Over the years, many courses were added. 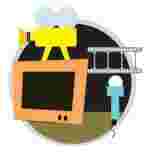 Advertising-public relations was introduced in 1981, Hindi journalism in 1987, and radio and TV journalism in 1997. A branch was also opened in Dhenkanal (Orissa). It has taken a long time to establish the institute as a brand," says J.S. Yadav, former director of IIMC, who was at the helm of the institute for 12 years starting 1987. Remembering his teachers at IIMC, Madhukar Upadhyay, a former BBC broadcaster and now chief editor of Hindi daily Aaj Samaj, says: “We had a distinguished faculty whom we just watched and learnt (from). They didn’t have to teach you. There was a certain aura (around them)." Upadhyay is a 1978 batch alumnus. In the past three decades, mass media has undergone a revolution of sorts, and its reach, access and impact have increased manifold. IIMC, too, has seen many changes. Today, the institute has two campuses—in New Delhi and Dhenkanal—a television studio, a printing press, a photo lab, one of Asia’s biggest mass communications libraries, and distinguished alumni. 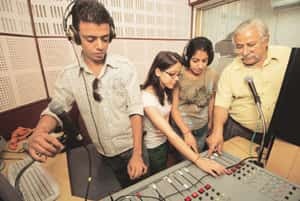 It also runs a community radio called Apna Radio, which gives students the opportunity to work on live projects. “IIMC is one institution where there is a heavy emphasis on hands-on practical training," says S. Raghavachari, professor of broadcast journalism at the institute. NDTV anchorperson and reporter Nidhi Razdan, who was a student of the second radio-TV journalism batch in 1998, sums up why the institute attracts hundreds of students every year, “The name carries a lot of weight in the industry." But IIMC has had its share of problems. “I have never seen the clock turning back. The institute has progressed, but it’s not in its full-fledged glory now," says Upadhyay of Aaj Samaj. Vacant faculty positions, a poor teacher-student ratio and growing competition from other schools have taken some of the sheen off this premier institute. With 14 faculty members, IIMC offers a teacher-student ratio of 1:20. To reach a 1:10 ratio, offered by most Indian Institutes of Technology, IIMC will need to hire 14 more teachers. Its Dhenkanal branch has just one full-time teacher for 76 students. “There was a lot of guest faculty... Since they were not in-house faculty, the (teacher-student) interaction was limited," says Anirudh Pahwa, who graduated from the advertising and public relations course this year. In the past, eminent persons have held the reins of the institute, such as media adviser to Indira Gandhi H.Y. Sharada Prasad, former chairman of the Editors Guild M.V. Desai and Unesco communications expert Lakshman Rao. Yet for three years, the institute has not had a full-time director. Stuti Kacker, joint secretary in the information and broadcasting ministry, who is also holding the charge of IIMC chairman for the time being, says: “We have gone through the process twice in the last three years. But suitable candidates have not joined because of various reasons." The first time the process to appoint a director was conducted, it was dissolved by the information and broadcasting minister, as there was a possibility of framing the rules to fit particular candidates. The second time, the selection committee chose Uma Kant Mishra, a senior Indian Information Service officer, who did not join. Mishra declined comment on the reasons for his decision. Star News’ Deepak Chaurasia, a 1991-92 alumnus, finds it surprising that it is taking so long to find a qualified person to head a premier institute such as IIMC. “There are so many qualified people in the field of journalism and also apart from it," says Chaurasia. It is a fact that recruiters are also taking note of. A senior journalist at one news channel, who did not want to be identified, rated the institute lower than before. “The moment you don’t have a proper head, there will be problems. And to add to that, things in other institutes have improved." Officials in the information and broadcasting ministry say a selection committee will review candidates on 26 June, and a director will be appointed soon after. Despite these problems, however, IIMC has succeeded in placing at least 70% of the students of the 2008-09 batch. “Even in a recession, most of my batchmates have been placed. It speaks volumes about the institute," says Anshul Baijal, a student of radio and TV journalism. “We are still attracting (the) best students who dream of a career in journalism. We are a public sector institution, not driven by (the) profit motive. Other institutes are charging exorbitant amount of fee in comparison to IIMC," says Anand Pradhan, associate professor, Hindi journalism, IIMC. The course fee for the print journalism course in English at IIMC is Rs34,000, against Rs2-2.5 lakh charged by private colleges. Perhaps that is its unique selling proposition. Himanshu Shekhar, 24, of Aurangabad in Bihar, left his job to pursue a journalism programme at IIMC. “I don’t regret my decision. IIMC was the best option for journalism." Rajdeep Sardesai, editor-in-chief of CNN-IBN news channel, counts IIMC among the institutes where a media organization should hunt for talent. “We have had very good products from IIMC," he says. Meanwhile, plans are afoot to upgrade IIMC into an international media university in the 11th Plan (2007-12). IIMC would then be able to offer both postgraduate and doctoral programmes. Former director Yadav, however, advises caution. “IIMC has the potential (to be a university). But it is important to address the issues facing the institute urgently, before it takes the next big leap."